Former equestrian eventer and inspirational brain injury survivor Polly Williamson joins a packed programme of speakers at an upcoming brain injury conference in Exeter. 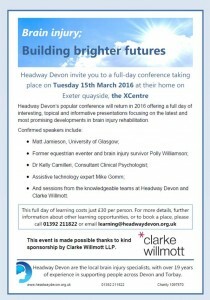 Organised by Headway Devon, the conference focuses on “Brain Injury; Building Brighter Futures” and takes place at the XCentre in Exeter on Tuesday 15th March. After sustaining a brain injury in a riding accident in December 2011, Polly was left facing complex disabilities and had to relearn even the most basic life skills such as how to brush her teeth. She has since made an incredible recovery and, although she has never ridden a horse since, she has gone on to build a successful training business. In her talk, Polly will be describing how brain injury transformed her life. “Where did I go? Rediscovering my identity, lost after a traumatic brain injury,” Polly’s full account of her experiences, is due to be released in paperback in April. Appearing alongside Polly will be a range of expert speakers presenting academic, legal, clinical and technological perspectives on the latest and most promising developments in acquired brain injury rehabilitation. Speakers include clinical psychologist Dr Kelly Camilleri sharing her frontline experience, researcher Matthew Jamieson from the University of Glasgow with some exciting recent developments, assistive technology expert Mike Gomm demonstrating the latest rehabilitation aids, and legal expert Heledd Wynn from Clarke Wilmott LLP reflecting on the Care Act. With such an interesting and varied programme, this conference represents a must-not-miss event for anyone whose work brings them into contact with survivors of acquired brain injury. Paul Bird, Headway Devon’s Learning and Development Manager, says, “We are delighted to be working with such a great range of knowledgeable and engaging speakers. The effects of acquired brain injury can be devastating for survivors and their families but this conference aims to highlight and share positive developments which we hope will help to build a brighter future for people with acquired brain injuries. 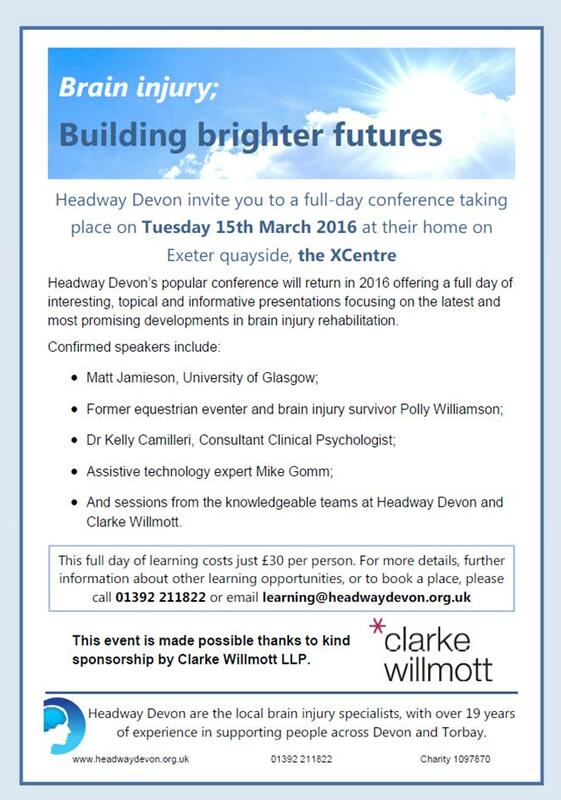 For more details, or to book a place, please call 01392 211822 or email learning@headwaydevon.org.uk.